It is with great sadness that we must announce the passing of our founder Jean Alice Sargent, 90 of Silver Spring, Maryland on January 24th, 2011 at her home in Riderwood Village. Jean will take her final voyage on June 23rd during the Babb Family Association Reunion. As her collective legacy we will transport her ashes to her beloved Appledore Island on the Isles of Shoals and there in Babb’s Cove near the site where Phillip Babb’s house once stood we will release her ashes back to the location from which we all came. She brought Phillip to us and we will return that favor. 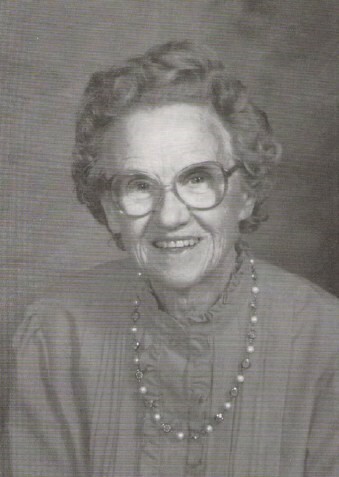 Jean was born in 1919 in Amesbury, MA to Alexander & Ruth M. Hill. After high school she attended Burdett Business College on an art scholarship and later attended Boston University and Corcoran Art School. She moved to Washington, DC during WWII and worked in the U.S. Office of Education and later in the Bureau of Labor Statistics completing her government career with 22 years at the National Security Administration and was listed as a member of the Phoenix Society. She leaves an older brother and his wife along with two nieces and a nephew as well as numerous friends. Jean became interested in genealogy after she retired and began going through her mother’s papers in 1975. She discovered her Babb ancestors through a difficult search for a 3rd great-grandmother. During the process she began corresponding with Ina Babb Mansur through a mutual interest in the Babb covered bridge of Windham, ME, since painting covered bridges was one of her favorite painting projects. Together with Ina she created the Babb Family Association in 1989, which now has an active membership of 170 and engages in preservation projects such as the rescue of a 225 year old Babb Log Home in Greeneville, TN and preserving and extending her work for all to enjoy. Perhaps her greatest legacy comes from her writings and the extensive genealogical research she did into the Babb side of her family ancestors. Over the years, she traveled much of the east coast visiting graveyards and researching documents. She published three books on the subject and was able to join her two favorite hobbies by including her artwork in all of the books. She retired from her work as Genealogist of the Babb Family Association (BFA) in 2001 and transferred her works and collected papers to the BFA for preservation. Since then, the BFA has worked with the Stewart Bell Jr. Archives in the Handley Regional Library in Winchester, Virginia to safely host the collection. Jean was not able to rest easy until she knew that her work would be preserved. After her stroke she became even more adamant that proper arrangements be made for its protection. In a sign of how important this was to her, she slipped from this world just hours after her body of work reached the digitizer. Jean’s collected papers occupy 34 boxes and some 32,000 pages. This is more than 3 pages for each day of her 26 years of research. The BFA has raised enough money to cover the scanning of the first half of this collection and is seeking an additional $3,000 in funding needed to complete the project. The family has requested that, in lieu of flowers, contributions be made to this project. Tax Deductible Donations may be sent to: Babb Family Association, 4252 Keys Drive, The Colony TX 75056.